I am a 26 year old aunt of 8 super fun kiddos! The kids have always been a big and important part of my life! We have lots of fun and I love helping them learn and grow! 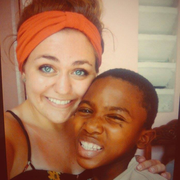 I've had a few previous nanny positions as well as time spent in Haiti working in various orphanages caring for children of all ages! I have a big heart for kids and family and am a big animal lover as well!